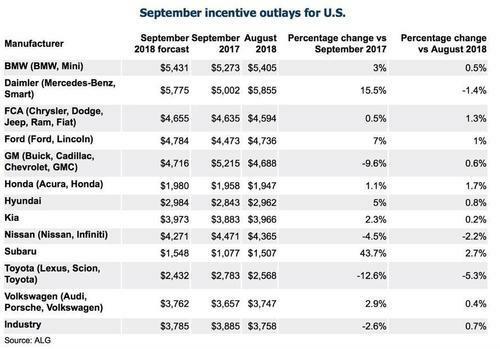 October Auto Sales Tumble: "Our Car Sales Are Down 12 Percent"
The downward spiral in the US auto industry is accelerating, and there may be no improvement anytime soon. 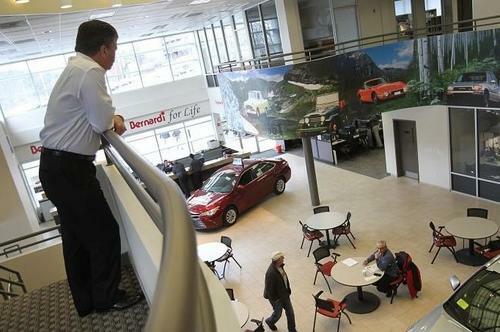 According to a new report by CNBC, October is shaping up to be another terrible month for the industry, after an already abysmal September, as auto dealers around the country have been plagued by marked drops in retail sales and customer traffic in their showrooms. Scott Adams, the owner of a Toyota dealership in Lee’s Summit, Missouri, told CNBC: “We are definitely seeing business pull back. September was off some, but this month our car sales are down 12 percent and our truck sales are down 23 percent." The report notes that the drop in sales was most pronounced last weekend. Another dealer in Tampa Bay, Florida said that sales this month were down 13%. Mark Scarpelli, president of Raymond Chevrolet and Kia in Antioch, Illinois stated that "Customer traffic has moderated. There is a little bit more of a pause because of the higher interest rates." He said that although sales are keeping pace with the prior year, people are taking longer to buy. 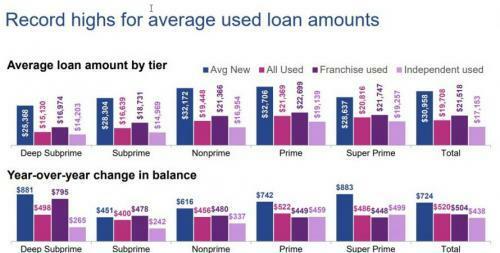 Recall that in September, the average new car loan jumped $724 year-over-year to $30,958 in Q2 2018, while used vehicle loan amounts increased $520 to reach $19,708, both records. Gary Barbera, a dealer from Philadelphia, PA, said his team needed to "dig a little deeper" to close sales this month. But he's the exception: sales are up 6% this month. Meanwhile, Edmunds is still holding on to its rosy outlook, predicting that 17 million vehicles (annualized) will be sold in October. These numbers may not be noticeably worse than last year because of improving fleet sales, the report states. As a reminder, we recently wrote that the uptick in interest rates was one factor having a profoundly negative impact on the automobile sales industry. The sudden end of dealer incentives is also crippling sales. And it looks as though the negative trends are going to continue. For instance, Renault just posted a larger drop in third-quarter sales than analysts expected. Echoing what we discussed two weeks ago when we observed the record drop in Chinese auto sales, Renault blamed the poor numbers on a global slowdown in sales in places like China and Europe, as well as on new emissions standards. Arndt Ellinghorst, a London-based analyst with Evercore ISI, told Bloomberg that Renault's earnings "...are unlikely to result in any positive sentiment shift" and that they were "an inconclusive start to earnings season".